It’s been 16 years since Norwegian telecoms giant Telenor first started expanding into Asia via Thailand. Today, Telenor’s chief executive Jon Fredrik Baksaas can confirm that its regional headquarters in Bangkok is an Asian hub and gateway of sorts, with word due soon on whether Telenor also can start operating in Thailand’s neighbouring Myanmar. The venture, Baksaas said, “has taken us from an investment period” to being a major operator in Asia and elsewhere in the world. Telenor’s Thai beginnings have helped propel the company’s operations in Malaysia, Bangladesh, Thailand, Pakistan, India and, possibly, Myanmar, which today offers huge market potential but also poses high risk and challenges unlike those in Thailand as the country formerly known as Burma emerges from decades of isolation. 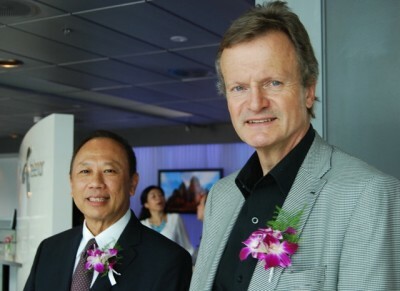 “When I first met Fredrik, I told him Telenor is doing a good job in connecting people in Thailand,” Ambassador Niyom said in his opening remarks at the midday reception on Friday. 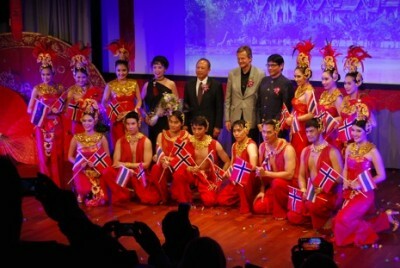 “But there are so many ways to connect people, also through culture.” The ambassador, who’s been involved in organizing several other Thai cultural events since arriving in Oslo early last year, was clearly proud to introduce the renowned Sbun-nga Chiang Mai Performance Troupe, recognized for its folk and contemporary dances, music and costumes. 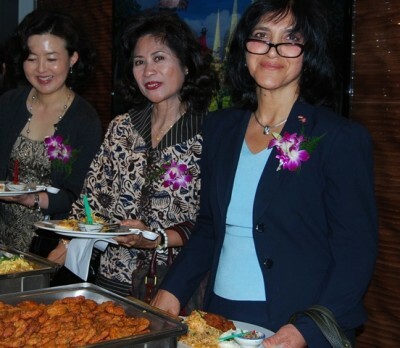 As guests mingled, sampled Thai food prepared by the chef at the Thai Embassy in Oslo and settled in for the show, Telenor expects that it won’t be long before more than half of the Norwegian company’s revenues will be generated in Asia. Sigve Brekke, the Telenor director now hoping to start up in Myanmar, told newspaper Dagens Næringsliv (DN) recently that the company can “recycle” what it’s been doing successfully in other Asian markets like Thailand. Telenor learned earlier this month that it was among 11 telecoms firms competing to buy two licenses to offer mobile communications in Myanmar, where less than 10 percent of its 55 million residents have mobile phones. Myanmar is seen as one of the last great frontiers in the mobile phone industry, and a market with huge potential along with risks. DN reported that one of Telenor’s major rivals, an alliance between Vodafone and China Mobile, withdrew from the competition over the Myanmar market, but others like Singapore Telecom, France Telecom and Axiata of Malaysia are still in the running. Brekke said he remains cautiously optimistic that Telenor will secure a license in Myanmar, but he and colleagues including Baksaas are also cautious in general. Despite recent reforms and a move towards more openness, Myanmar is known as one of the most corrupt countries in the world. The last thing Telenor needs is more trouble with overseas operations like it’s had in India and with Vimpelcom, and that’s part of the reason Telenor is launching its Myanmar effort alone, without a partner that it can’t control. “It’s entirely possible someone will be more aggressive than we are,” Brekke told DN. “We aren’t going to Myanmar to plant a flag, we want to go there to earn money.” He also said Telenor is “very clear” over the corruption risk. Meanwhile, at Friday’s lengthy reception at Fornebu, Baksaas appeared a relaxed host despite the constant pressure and problems tied to running a large international firm. He told newsinenglish.no that Telenor expects to hear this week whether it wins a license in Myanmar. Its regional headquarters in Bangkok will likely play an important role as any operations get going, he said, since Bangkok remains the main gateway into Myanmar. And Baksaas remains confident that communications “will just grow and grow” and continue to develop. “I like to say it will take the same route as electricity,” Baksaas said. “Communications is the catalyst for growth,” he claimed, and “to not be connected is awful,” whether through lack of a mobile phone or culture. With that, the music and dancing began.